The misguided and Satan-inspired notion that worship is not worship unless someone with a velvet perfect voice and a group of talented, skilled musicians are leading it, has paved a highway for demons and sexual perversion to fill churches. The failure by ministers to articulate or define the place and nature of praise and worship and those who lead it in the church, has created a very dangerous and erroneous perception which needs to be corrected unless believers are content seeing Lucifer setting up his throne in their midst. Praise and Worship is an activity which is crucial in a believer’s life, but is (doesn’t have to be ) necessarily music based or centered. Because of this lie that when guitars, keyboards, drums are played and beautiful voices begin to sing, regardless of the character or spiritual state of those playing or singing, God like some bored rural township market vendor will get so excited, stop everything that he will be doing and rush to manifest himself in and through that music, is spiritual balderdash and must be trashed with the contempt that it deserves. Many groups or individuals generally referred to as WORSHIP TEAMS OR GOSPEL MUSICIANS despite being skilled, have no worship in their hearts, no fear of God, live morally unregulated lives waiting to be hired so that they can go and play at the next highest paying church. They move from church to church contaminating both young and old with their spiritual AIDS of insubordination, lawlessness, sexual predator habits and other totally un-scriptural behavior. 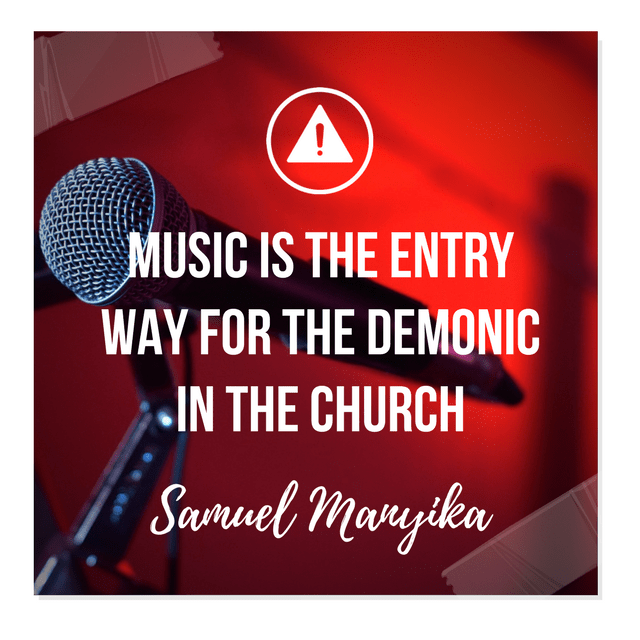 Their claim to playing in church is based on their musical skills, which we also know Satan has in abundance, not HOLINESS which is an absolute prerequisite for those who stand before God. The word of God commands us to worship the Lord in the beauty of holiness. These musicians serve the purpose of pacifying and entertaining unrepentant night clubbers and other such characters who fill churches today, so that they do not really miss what they used to do. They also help lull un-discerning believers into thinking that because the music is there God is present. The truth is, there is no scriptural basis to the lie that all worship and praise is musical in content. There are many instances in the bible where groups of people and individuals raised their hands or knelt in worship WITHOUT MUSIC but with sincere, clean and repentant hearts. Nehemia 8:6. And Ezra blessed the Lord, the great God. And all the people answered, Amen, Amen, with lifting up their hands: and they bowed their heads, and worshiped the Lord with their faces to the ground. 1 Samuel 15:31.Then he said, I have sinned: yet honor me now, I pray thee, before the elders of my people, and before Israel, and turn again with me, that I may worship the Lord thy God. So Samuel turned again after Saul; and Saul worshiped the Lord. Music is an exciting and important component in praise and worship, but certainly not central or so indispensable that the state of those providing it should be accepted unconditionally even when its corrupt and tainted with sin. Here is a bold but true statement. THE BACKSLIDDEN,SINFUL,ARROGANT,UNREPENTANT SPIRITUAL STATE OF MANY HIGHLY SKILLED MUSICIANS HAS BEEN RESPONSIBLE FOR KEEPING THE PRESENCE OF GOD AND THE ANNOINTING AWAY FROM GOD’S CHILDREN DENYING THEM THE MIRACLES,HEALING AND BREAKTHROUGHS THEY DESIRED AND DESERVED! The noise was there, the dancing was there, the technically perfect beautiful music was there but NOTHING of spiritual value happened. All that manifested was a fake manufactured presence of God. Anyone who has ever experienced a genuinely anointed worship service can easily tell what a few seconds in the presence of God does in transforming and touching lives. When Moses came down from communing with God on Mount Sinai he heard a noise, the noise of a multitude dancing before an idol. There is nothing as sad as a group of so called believers or ministers who cannot tell the difference between Godless noise and pure unadulterated worship. Exodus 32:17.And when Joshua heard the noise of the people as they shouted, he said unto Moses, There is a noise of war in the camp. And he said, It is not the voice of them that shout for mastery, neither is it the voice of them that cry for being overcome: but the noise of them that sing do I hear. And it came to pass, as soon as he came nigh unto the camp, that he saw the calf, and the dancing: and Moses’ anger waxed hot, and he cast the tables out of his hands, and brake them beneath the mount. And he took the calf which they had made, and burnt it in the fire, and ground it to powder, and strawed it upon the water, and made the children of Israel drink of it. TO BRING BACK THE GENUINE PRESENCE OF THE LORD INTO YOUR CHURCH, BEGIN BY CHECKING WHO IS LEADING YOUR PRAISE AND WORSHIP, SINGING IN THE CHOIR OR PLAYING IN THE BAND. DO NOT APPOINT A MUSICIAN ONTO YOUR TEAM WITHOUT A THOROUGH BACKGROUND CHECK,THEY MAY HAVE A TRAIL OF PREGNANT WOMEN,SEXUALLY TRANSMITTED DISEASE INFECTED VICTIMS OR OTHER SCANDALS BEHIND THEM WHICH MAY ALSO END UP MANIFESTING IN YOUR CHURCH. MINISTERS GIVE WHAT THEY HAVE, MUSIC NO MATTER HOW WELL PLAYED OR GOOD IT SOUNDS WILL CARRY AND TRANSFER THE SPIRITUAL CONTENT OF THE ONE PERFORMING IT. If as a leader you give a platform to wayward musicians without making any effort to know their spiritual state,you are guilty of perpetuating ,fertilizing and providing cross pollination conditions for sin in the body of Christ. I also want to state that it is the most spiritually deceived and defiled church leader, who can even imagine that a pot smoking, foul mouthed, drunken, sexually perverted but talented zim dance hall musician can stand before a congregation and summon the presence of a Holy God. This is the ultimate in mocking, desecrating and defiling an altar and can only be sanctioned by one who also engages in a form of Satan worship. 1 Timothy 2:8.I will therefore that men pray every where, lifting up holy hands, without wrath and doubting. Only HOLY HANDS must be lifted in the presence of the Lord. Holding marijuana, gropping girls, picking up bottles of alcohol certainly does not produce holy hands! The good news is that God is good and merciful, if we humble ourselves before him and do not mock him and come boldly to the throne of grace through the blood of Jesus, he will gladly forgive and cleanse from all unrighteousness. LET US HAVE SOME HOLY WORSHIP IN THE HOUSE!